For Edamame Mango Relish: In a small sauce pan, add orange juice, red wine vinegar, and sugar. Bring to a boil, turn down to a simmer. Simmer until mixture is reduced by half. Cool. In a large bowl, add remaining ingredients and mix well. Season with salt and ground black pepper. Add orange juice reduction, mix. Refrigerate for 2 to 3 hours to allow flavors to develop. Use as an accompaniment to egg rolls. 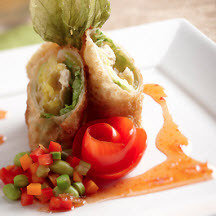 For Chicken Egg Rolls: Season chicken with ginger and garlic powder and mix thoroughly. Heat mixture in a medium skillet, stirring, until chicken is cooked through. Set aside. Combine flour and water in a bowl until they form a paste. In a separate bowl combine the cabbage and the reserved chicken mixture. Mix all together. Lay out one large egg roll wrapper with a corner pointed toward you. Place about a 1/4 to 1/3 cup of the cabbage and chicken mixture on an large egg roll wrapper and fold corner up over the mixture. Fold left and right corners toward the center and continue to roll. Brush a bit of the flour paste on the final corner to help seal the large egg roll. In a skillet set over moderately high heat, heat the oil to 375°F (190°C) and sauté the large egg rolls until golden brown on all sides, using tongs to turn them. Serve when cool enough to eat with Edamame Mango Relish. Recipe and photograph courtesy of The Soyfoods Council.